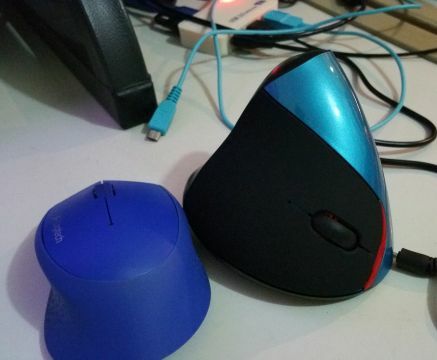 The vertical mouse which cost me about $14 arrived today. I learned from long experience that is not such thing as a true ergonomic mouse. Use any of them long enough and it is going to hurt your palm and eventually cause RSI. I think a practical way around this is to have two mice and switch between them. Since they are to be held differently they should pair well. It feels kinder on the wrist. The better DPI also help in moving less. No the vertical mouse is a cheapo I bought off eBay :-) Actually I am using three now. A microsoft Arc Touch mouse which allows my fingers to wrap around. The idea is to be able to let the palm hold and fold differently from the different shape of each mouse.